But despite their proven importance, many business owners dread and avoid accounting tasks. In fact, 40% of surveyed entrepreneurs claim that bookkeeping is one the worst parts of running a business! Wondering if it’s really worth the aggravation? Here are four reminders of how effective bookkeeping is the cornerstone of small business success. A reliable system for tracking reimbursable expenses ensures you reap all the benefits you’re entitled to when filing your taxes. Expenditures sorted into categories, such as “food”, “travel”, and “office supplies,” can be catalogued quite simply with online bookkeeping software. Using a dedicated credit card for business expenses, and updating your records on a monthly basis, will put money back in your pocket come tax time. In order to grow your business, you must be able to track and compare its finances from one year to the next. develop data-based strategies for expansion. Few things are more stressful for business owners than scrambling to get poorly maintained financial records ready for tax season. In addition to the panic of last-minute filing, inaccurate or incomplete documentation can lead to serious penalties, fines, and even an audit. In the United States alone, 40% of small businesses pay an average penalty of $845 per year for late or incorrect filings! 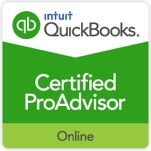 Save money and get peace of mind with sound bookkeeping. You’ll be assured of compliance with regulations, and will receive a reliable estimate of amounts owing long before your tax bill is due. Most entrepreneurs are passionate about developing new business ideas – not crunching numbers. Employing a professional bookkeeper, even on a part-time or as-needed basis, can help optimize your accounting and increase overall profitability. There’s a good reason 71% of small businesses outsource at least one accounting function to help manage tasks like payroll, closing the books each month, and managing accounts receivable. It’s well worth it. Invest in effective bookkeeping and you’ll build a solid foundation for a resilient, forward-moving small business.